Naturalize is Chris Russell’s first solo exhibition with the gallery, following his introduction during our August 2016 New Views show. 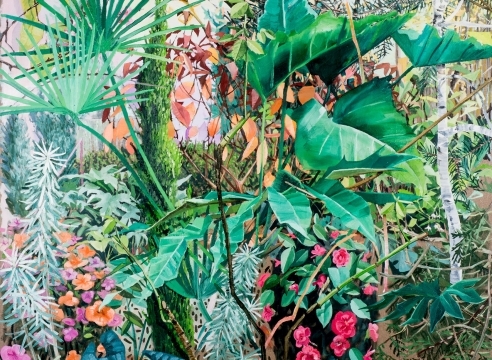 He has shifted his focus from an exploration of wilderness focusing on dense imagery of foliage, to a reflection on humanly shaped spaces of gardens and cultivated nature. His creative process remains painterly, building up images of plant structures and patterns that take on gestures of abstraction, reminding the viewer of the presence of the artist’s hand in the making of the painting, much as the gardener’s hand shapes the landscapes of his or her making. Chris Russell’s paintings explore the tension between observation of the natural world and its recreation on the painted plane. He embraces his Portland home, and its access to nature, but is constantly aware of human-imposed boundaries on the natural world. Similarly, he is engaged by the formal act of painting: mark making, rendering, spatial construction, and how these actions translate the observed experience of nature, especially the dense layers of forest that are ubiquitous in the northwest. Russell states, “I am interested in a painting that becomes an image of the process of its creation.” The painters’ marks are clearly evident, while the lush, entangled landscape imagery constantly vies for our attention. Born in Colorado, Russell received his BFA from the California College of the Arts. His work has been exhibited in San Francisco, CA and Turin, Italy.